USB 4 Port 3.0 Hub, JSAUX Ultra Slim Aluminum High-Speed Data Transfer Hub Compatible with MacBook, Mac Pro/Mini, iMac, XPS, USB Flash Drive, Mobile HDD, Surface Pro, Notebook, PC and More by JSAUX at Andy Pemberton. MPN: JSUSB3HUBGREY. Hurry! Limited time offer. Offer valid only while supplies last. 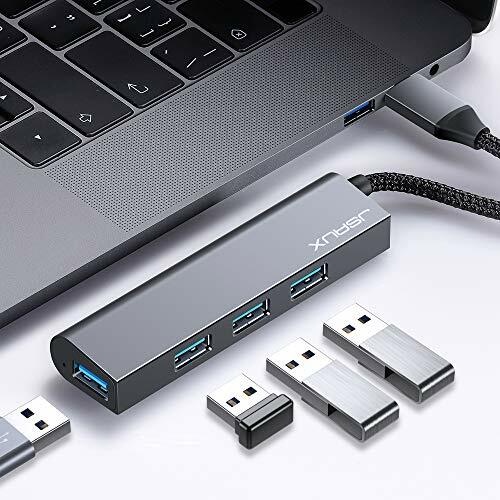 【4 USB 3.0 Ports】: Extends to 4 USB 3.0 ports, connect 4 USB devices simultaneously, such as external hard drives, USB flash drives, mouse, keyboard, memory cards, and much more. 【USB 3.0 Super Speed Transfer】: Full USB 3.0 super speed data transfer up to 5Gbps, 10x faster than USB 2.0. Transfer files, HD movies and songs to your USB-C devices in seconds. 【Nylon Tangle-free Design】: Tangle-free Nylon Braided Design, this 4 Port USB 3.0 Hub is far more dependable than others in its price range. Premium nylon braided cable adds additional durability and tangle free. 【Multiple Protection】Made of high quality chips and material, providing over-current, over-voltage, short circuit, high-temperature quadruple protection, more safe than others. 【Optimum Small Design】The surface sandblasted increases the touch feeling of delicate, also it is lightweight and portable, this hub is ideal for home, office, or anywhere you go.